The Trust arranges a wide variety of events throughout the year as both Social and Fund Raising occasions, for Trust members and the wider public to enjoy. These include waterways shows and exhibitions, weekly restoration work parties, lectures and talks, Open Days at restoration sites, canal walks and evening social meetings. 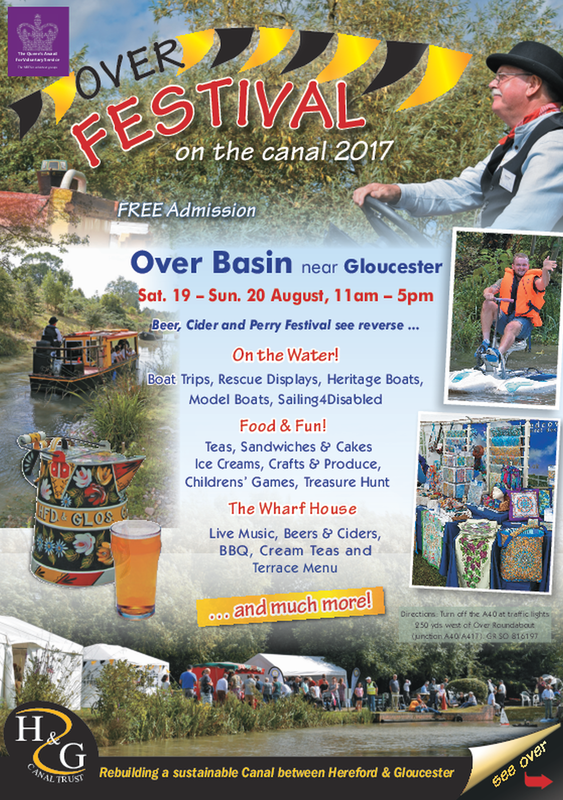 Herefordshire & Gloucestershire Canal Trust's 'Over Festival on the Canal 2017' has taken place. This year’s Festival promises to offer another fun weekend around Over Basin with an even bigger craft and produce marquee, boat trips, walks, fun for the children, demonstrations and refreshments. Meanwhile, on the terrace at The Wharf House, a second part to the event with some great local bands playing and an excellent array of beers, ciders and perrys. There will be the popular Wharf House cream teas as well as a BBQ. The following week there will be a continuation of festivities at Malswick House. Saturday 26 August 2017, starting 4pm on the edge of Newent. Free admission to both events. Please download a posters of the events to display. 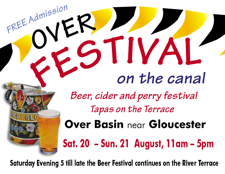 Herefordshire & Gloucestershire Canal Trust's 'Over Festival on the Canal 2014' was the most successful yet. 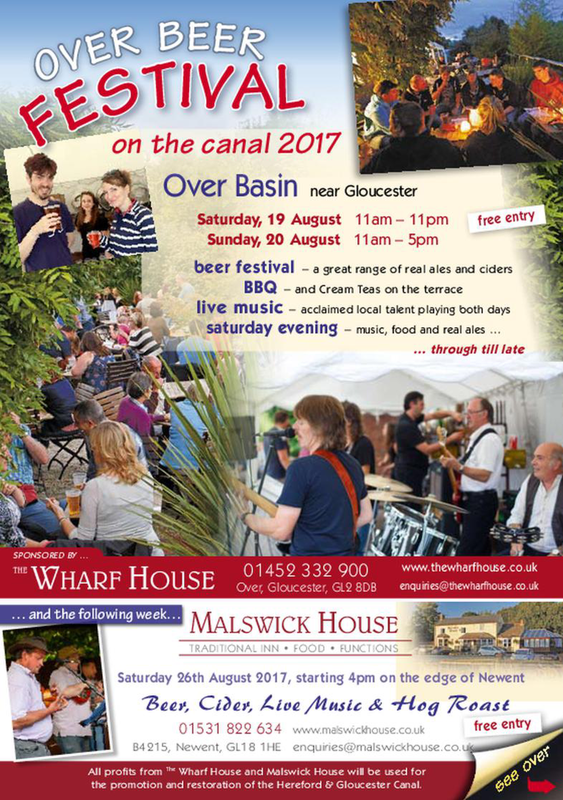 The annual 'Over Festival on the Canal' was the largest so far. The site including the canal basin at Over, was visited by more than 1000 people to savour and discover and enjoy the wide variety of attractions in near perfect weather. The site is also the head office of the Herefordshire & Gloucestershire Canal Trust and Visitor Centre at The Wharf House, the AA-Red Rosette-awarded Restaurant with Rooms. Entrance to the Festival was free, for all to enjoy the usual sideshows and stalls associated with a family fun day out. There was obviously a watery theme, enhanced by visitor participation with a Model Boat regatta, Fire Brigade displays and canoeing and kayaking. The Canal Trust's own heritage boats provided tours of the canal to Vineyard Hill. This year included the addition of Shetland ponies to provide rides for children, circus skills and other attractions in partnership with the Scout Network. There were large marquees housing a range of local produce and crafts for sale, including local beers, cider and perry. There was the largest programme to date of live music on the river terrace with The Wharf House providing refreshments of Tapas and a hugely successful Beer Festival. For everyone there the message of canal restoration through Herefordshire & Gloucestershire Canal Trust was implicit everywhere. Herefordshire & Gloucestershire Canal Trust is grateful for the generous support of Gloucester Quays and the Gloucestershire Network of Scouts in mounting this Festival. The Festival next year will be held on Saturday 22 and Sunday 23 August 2015.